Looking for a fun after school snack or a special treat for your child’s lunchbox? 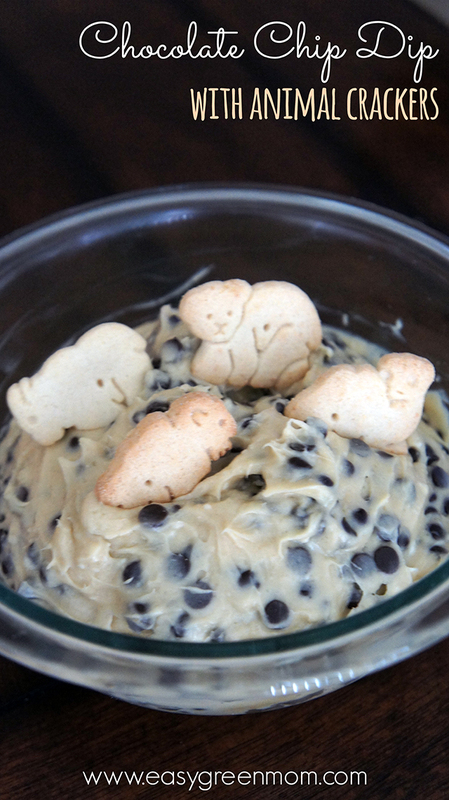 How does gluten-free animal crackers with a Chocolate Chip Dip sound? Pretty good to me and my kiddos! Best of all the dip is really easy to make! I was inspired to make this dip from my latest trip to Walmart. They had new gluten-free products out on display, Glutino Animal Crackers and Udi’s Chicken Alfredo! I picked up both because I am always looking for new products for my family to try, my husband and son have Celiac disease and must eat gluten free. I love how Walmart is really trying to cater to those who have to eat gluten free by widening their selection of products and offering them at affordable prices! Glutino Animal Crackers are great and tasty on there own but I wanted to kick them up a notch with a special dip just for them! Here enters the Chocolate Chip Dip recipe! Not only is this dip a tasty crowd pleaser but it can be made in less than 5 minutes! My kids eat this dip up and think it is great suprise when I pull it out for them. The dip and animal crackers are perfect for an after school snack or packed in a lunchbox! This would also be great to serve at any party but you will probably need to double or triple the recipe based on how many guest you are having and how much they love animal crackers and dip! If you want a healthier option for this treat consider serving the dip with apples or other fruits. My kids like it serverd with apples or strawberries! A tasty addition to animal crackers, graham crackers or fruit! Great for snacks or parties! In a medium size bowl, mix cream cheese and butter until mixed completely. Add sugars and vanilla to mix; beat until smooth. You can find Gluten-Free products for less at your local Walmart! Be sure to try the new Glutino Animal Crackers and my dip recipe! You can learn more about gluten-free brands available at Walmart and find awesome recipes HERE. I just pinned this recipe and printed it to make tomorrow for my daughter’s after school “snack” to start off a great holiday weekend. We may make more for our pool party on Sunday if it goes over well with my little one. Thank you so much for sharing! That dip looks amazing and I didn’t realize they made GF Animal crackers! Can’t wait to try this out! This chocolate Chip dip looks incredible. I love these GF animal crackers! Holy moly, this sounds delicious. I might have to bring this to our small group! Oh that dip sounds just amazing!! I love how you served it in the silicone cupcake holders!! Super cute idea for a kiddo play date!! This is a recipe right up my alley! Chocolate chip is one of my all time favorite flavored. I am always looking for new recipes or products with them to try. This one sounds extremely flavorful, new and different. It would also go really well between two graham crackers. I bet this would definitely be a hit with my grandchildren 🙂 sounds tasty to me.. I love this kind of recipes. Cream cheese and chocolate? Match made in heaven. Thanks. This looks delicious, I too love Udi’s brand products and will have to keep an eye out for that fettucine alfredo, one of my favorite meals! I can’t wait to make this with my son! I think we’d both really like it!